Flavio De Cristofaro is the VP of Engineering at Core. He used to run our Security Consulting Services (SCS) group and long time password cracking enthusiast was recently asked to present at AppSecLatam2012 on Lessons learned from Recent Password Leaks. 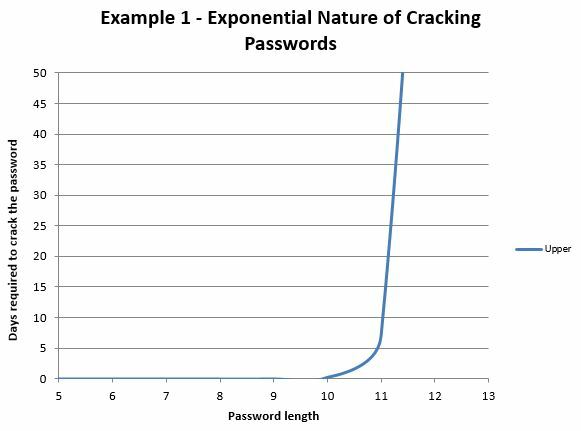 The following is his analysis on the exponential nature of password cracking costs. To show how the four components above relate to the initial questions asked by management, I won’t give a definition of these four components. 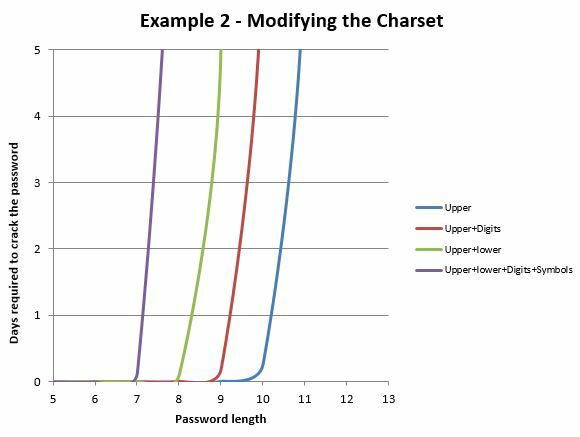 Instead, I’ll present you with a few meaningful examples that illustrate how changes to these components affect the strength of the protection of your users' passwords. Example 1 – Cost of cracking a password Let’s say that the compromised database had only one single password hash corresponding to the site’s administrator. The password was hashed using a hashing algorithm not suitable for password protection (like MD5) and the attacker has access to a very standard computer with an i5 processor and an ATI Radeon 7970 graphics card (which, on amazon would cost approx $213 and $443 respectively). 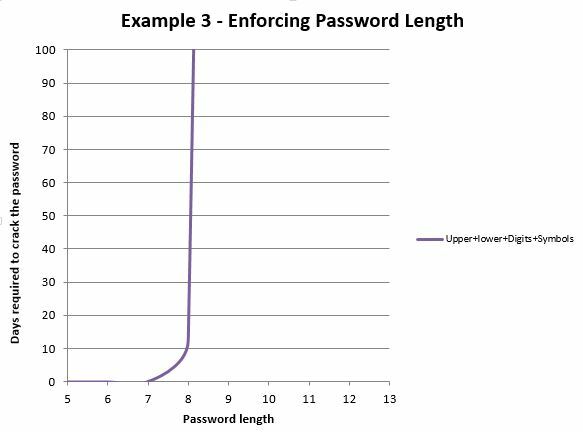 This figure shows the exponential nature of time needed to crack passwords. As can be seen, in the scenario where the attacker is trying to crack the password using uppercase letters only, using the hardware setup I previously described the attacker won’t be able to cover (at least in two months) all the possible combinations for passwords that are more than 12 characters long. Example 2 – Enforcing a password complexity policy For this example let’s use the same preconditions as in example 1. By modifying the charset in use we’ll obtain the following graphic. 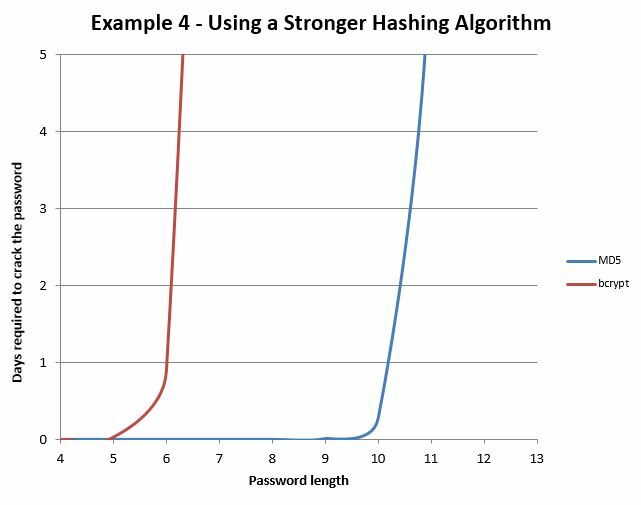 The difference is dramatic, by using a stronger algorithm to hash the password and forcing the attackers hardware to spend more time to process each possible password we can make it unrealistic for the attacker to reverse a reasonably long password in a given time frame. Example 5 – The effect of salting passwords In this final example let’s assume that the attacker was able to obtain a list of 10 password hashes hashed using MD5. Now the attacker has a couple of options to get the plain text password for example using Rainbow Tables or applying brute force. If you decided to salt your passwords you’ll be limiting the options of the attacker (he won’t be able to use Rainbow Tables against the salted passwords) and you’ll be also increasing the time/computational power required to crack the universe of 10 leaked passwords considered in this example (The attacker must run the same brute force attack 10 times, one per password+salt pair included in the list). Throughout these examples we presented important components to take into consideration while designing your password-based authentication scheme. In any case you should consider using a combination of these factors as a single measure won’t be really helpful. For example if you salt your passwords but your password policy allows using passwords like 1234 your efforts to protect your passwords will prove fruitless. If users are allowed short passwords with no special requirements then their password could still be cracked, but by taking the time to understand what would be possible for an attacker to reverse we can implement password policies that help elevate the threat and can be easily explained/defended to our users and businesses.